1 in 5 Latinx Americans have no religion. 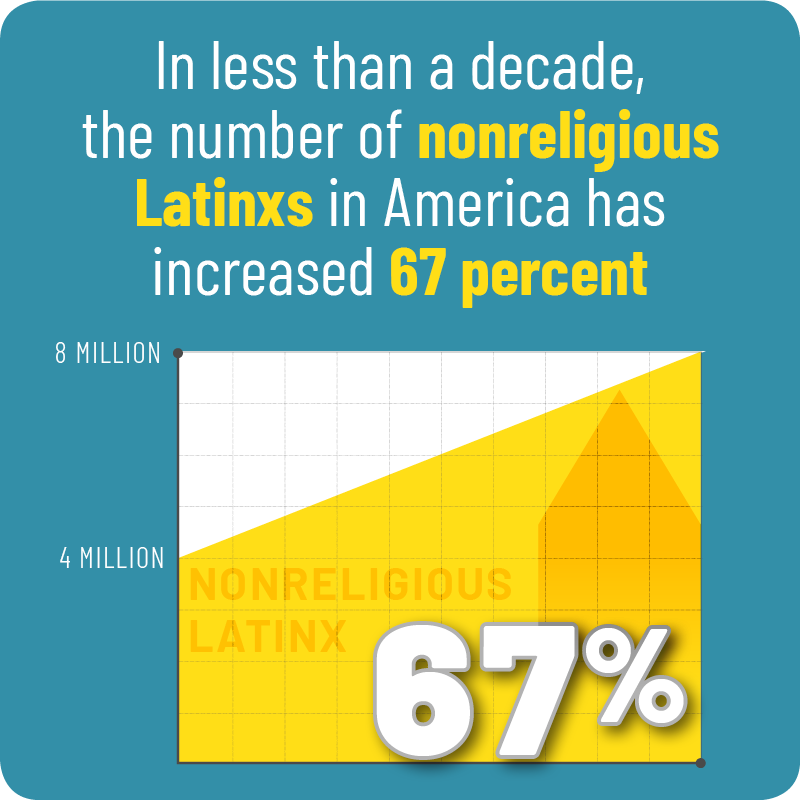 In less than a decade, the number of nonreligious Latinxs in America has increased 67 percent, doubling from around four million Americans to more than eight million. 32 percent of Latinx adults between the ages of 18 and 29 self-identify as nones—religiously unaffiliated (so named because of the “none of the above” checkbox in surveys about religion)—whereas the same age group comprises only 20 percent of the Latinx Catholic community. Each year, more people are leaving religion and more non-religious Latinx parents are raising non-religious kids. Many of us were raised as Catholic (57 percent) and Protestant (22 percent) before becoming nones, while 14 percent of our community grew up in nonreligious families. Some of us are atheists. 4 percent of Latinx Americans identify as atheist or agnostic, which is double the number of Latinx adults who identify as a non-Christian religion (such as Judaism, Buddhism, and Islam). The percentage of nones in the Latinx American community closely aligns with the percentage of nonreligious people of the United States, where nearly 23 percent of Americans are nonreligious and we are creating community in new and innovative ways. That’s where the Latinx Humanist Alliance comes in. Our mission is to facilitate social justice activism among, expand the visibility of, and foster safe spaces for Latinx Humanists. We work toward this mission through education, legislative advocacy, and activism. Contact us to learn more.